I've fallen behind on my hexagon posts. I've been absorbed with a few other projects lately, along with work, preparing to move next month, and constantly driving back and forth to town. But, I thought it was time for an update, so here goes. I've got 472 hexagons attached to another hexagon. I'm still sewing strips of 10 and 11 together into sections and planning to attach the sections once I have more completed. I'm hoping this method will distribute the fabrics from the same collections evenly throughout the quilt. A few weeks ago, I noticed another duplicate I sewed in by accident but, I'm not going to tell you where it is, you'll have to find it later! So, I went through all my basted hexagons and pulled out a number of additional duplicates. I was surprised at how many more I found. Along with the duplicates, I pulled out a number of hexies I've decided not include, mostly because I decided that the fabrics were too light/pale or too sophisticated for me. As of today, that makes my basted-but-not-attached hexagon count 726. The stacks above contain 25 hexies each. I have no idea how many fabrics are in this 3.5" stack of squares. These are the fabrics I have yet to baste from swaps and new fabrics I've cut into. 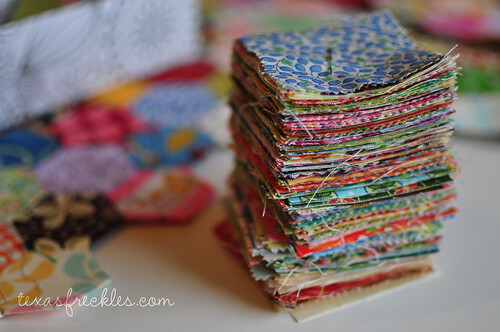 I still need to go through my folded stash and cut squares from those fabrics. I'm going to hold off on any more swaps until I get more of these fabrics basted. Here's the box I'm using for hexagon storage with all the necessary supplies. And this is an adorable little box I found in the school supply section at Target. It has a magnetic closure. This collection is so cute I couldn't resist some folders and notebooks too. The best part about this box is that it fits in my handbag (I usually carry a big-ish handbag) and holds everything I need to make hexies on the go. 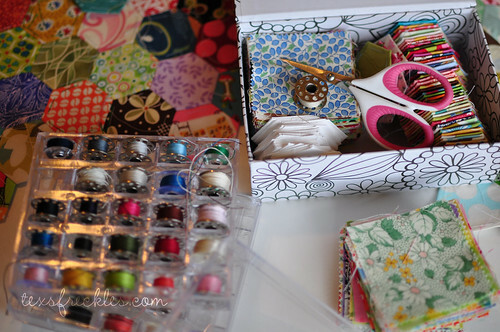 Fabric squares, papers, scissors, needle and thread. 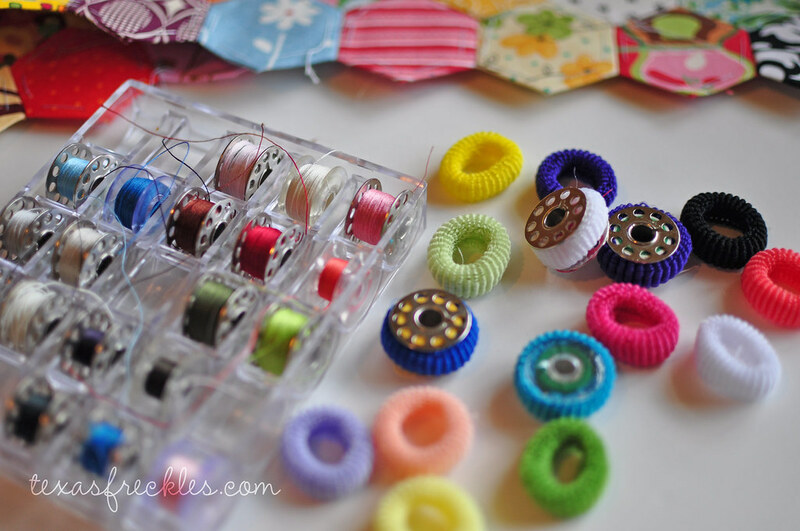 My tip for the week: Use old bobbins of thread to baste your hexagons. The bobbins are much more portable than a spool of thread (which wouldn't fit in my new box) and in my case, I have lots of wound bobbins from old clothing projects that I'll likely never use again. If your bobbin thread gets unruly, use some of those little stretchy, fuzzy ponytail holders to wrangle the thread. Don't overpay buying them at the sewing store, just buy them at the drugstore. There are 175 members in the hexagon charm quilt flickr pool! I really need to spend some time over there admiring all the beautiful work everyone is sharing. If you are in need of fabrics for your quilt, there are a number of swaps going on also, so check out the discussions. Thanks for the love on the cheater fabric. So far, I've only received the initial FQ I ordered before I entered the contest. Those poor guys must be overwhelmed with orders. I've ordered additional yardage to cut into FQs, so I'll let you know as soon as I receive the yardage. I'll get another post together, maybe for tomorrow, with my thoughts on how the fabric turned out. So, how is your hexagon quilt coming along? Your little hexagons are so pretty. I'm inspired! 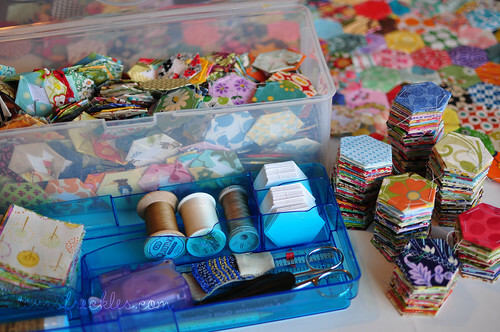 Do you cut out all the hexagon pieces that you wrap the fabric around, or do you buy theme somewhere? I MUST make hexagons!!! I always find a new fabric amongst your hexies I love. Completely inspirational! Now I've sewn so many I like spotting the fabrics I've used that other people have. I have nearly pieced together my top! 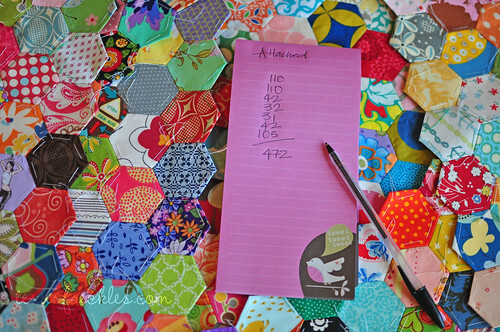 I was keeping track of how many hexies I'd pieced as I went along but I really need to count again! I'm happy to say that hexie fever is in full swing! I've had a few nights of watching tv and getting into that "hex haze" where I just keep going and going. I'm 2 1/2 weeks in and I have almost 250 hexies basted. I even made on while waiting at a drawbridge the other day! Every time I look at all the hexagons you made, I get sooo jealous! It's going to be an awesome quilt. Also, great idea for the unruly bobbins, I'm definitely going to do that! LOVE your blog... you inspire me!!!! I love you forever and ever for the ponytail holder hint - you have made my life so much better ! Thank you, sweetie ! Your hexies are looking great. I started on June 22nd with a goal of 2,704. At this time I have 562 hexies with fabric and paper ready to go for lots more. No rows yet! I still can't believe you are piecing that many hexies!! Soooo much work - but you go girl! I will be divine when it's all done. I am having SO much fun making hexies. Really. I'm totally inspired. I found the cutest little tin box at Borders today, like a miniature lunch box. I put a little magnet strip in the lid which can hold pins and needles. Very portable...and cute. I might have to post a picture of it on flickr or something. Thanks, Melanie! 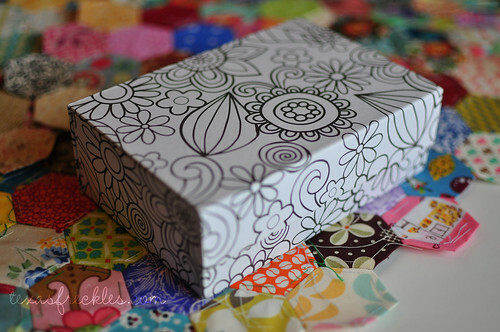 Oh Melanie, i am enjoying my charm hexies sooo much! Thank you! Now I am back, and enjoying my rainbows of colours again. I haven't counted my hexies just yet, as I am having too much fun with the whole process. I know what you mean about spotting duplicates; so dissapointing. I haven't attached any hexies yet. I am waiting to have enough of all colours so the distribution can be a bit balanced. I love your tips, Thanks! Hoping all goes well with the move and I really can't wait to see your finished quilt top! Oooo you've made so many hexagons! Great work! I love how your hexagons are looking sewn together. So pretty. I'm nearly at 700 and would love to add hexagons from your cheater fabric so I can't wait for news about that. I'm holding off buying it until you post about it. 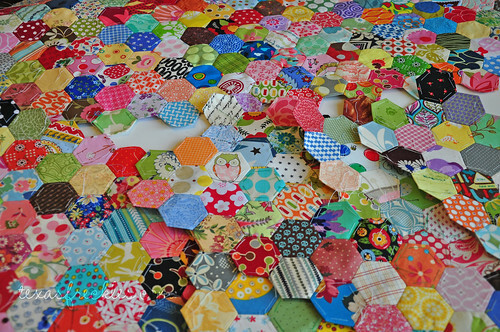 Thanks again for organising the quilt along - it is a lot of fun and really inspires me to make my hexagons. I think I'm in love with your quilt. your hexagons are looking great! 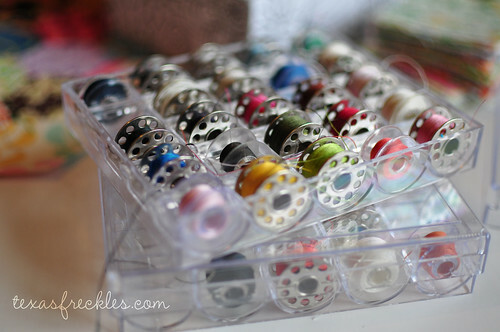 great idea about using old bobbins. i bought a new sewing machine last year that uses different bobbins than my new one so i have plenty to use up. thanks to large quantities of travel time on my recent vacation, i have 650 hexagons basted and 21 monochromatic flowers made. i love how this is turning out! I'm definitely inspired to work on hexagons again...LOVE your photos! I love to just look through your photos with all those great fabrics. This hexagon quilt is such an epic project I can hardly wait to see it finished. Oh no... 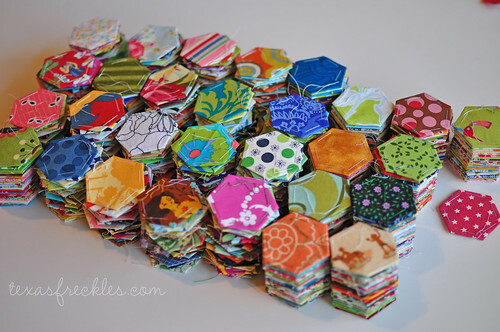 I've only just gone and read all your posts about hexagons and now I want make some!!! I did made a hexagon sewing machine cover earlier in the year but didn't like the end result and it put me off doing another hexagon based project but seeing all your vibrant fabrics has made me want to start a quilt now. Thanks for the inspiration! Your hexies are coming along so nicely! I haven't done much with mine in the last week or two. But I'm taking a trip soon, without hubby and kiddo, and plan on working on them while I'm gone for 9 days. And soon we will be making the 10-hour drive to OK to visit family - another good opportunity to work on my hexies. Thanks again for your great printed hexie sheet! Hi Melanie, I've fallen behind on my hexie project as well. I have a lot going on at home with a three month old baby and my return to part-time work. Also, I have a couple of quilting projects on the go! I'm heading over to flickr to check out other people's progress. I totally want to join the hexy madness!!! Curses! I just threw out some old metal bobbins. And just before I did I thought to myself, "Now, is there any other way I could use these? Nah!" When I find some more around the house, I'll be sure to use this idea too. What a fantastic post! I am smiling from ear to ear. All that Hexagon loveliness... I am a beginner. I mean REAL beginner. I remember seeing you making hexagons about a year ago and thinking "Naaaahhh, its not for me..." and here I am - sucked into the hexagon making. this post is inspiring. Great tip on the bobbins and ponytail holders. Great pictures of your billions of hexagons. This creation will be a real gem. Absolutely beautiful. :) Thanks for sharing.